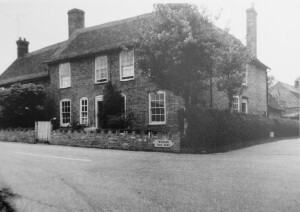 School House stands on the crossroads where Church End, Potters End and what locals call School Lane meet. (School Lane seems officially to be part of Church End.) 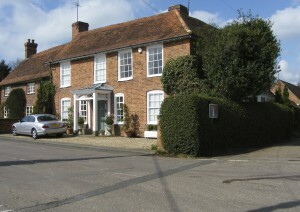 It was the home provided for the headteacher of the school. Nowadays, it’s a separate private home, and a very fine one too. Two interesting pictures turned up in John Blomfield’s effects, and Anna Blomfield has kindly leant them. It’s not known where either came from. If you think you are the copyright owner and would like them removed, please get in touch. The date of this photo isn’t known, but there are some clues. The sign on the wall shows the way to “Woburn Zoo Park”. The earliest reference I can find to this was in 1955. From 1967 onwards, it was called both this and “Safari Park”, and the term “Zoo Park” continued in use until at least 1978. The aerial on the leftmost chimney looks like one for VHF TV, which would put the date in the 1960s. When did the last headteacher leave School House? This second picture is a copy of what seems to be the copy of a print of a watercolour. It’s labelled, “House at Eversholt in bedfordshire, formerly Mr. Stovins”. (Or Storins. And there may be an apostrophe somewhere, but it might just be a dirty mark.) It’s very similar in style to the pictures of Church Farm and Linden House. This was a particularly dirty picture and the version here has been extensively photoshopped and cropped to remove defects, but it shows the building recognisably. The chimney locations and the door and windows on the side are the same. If it’s the same date as the other two pictures, it will be about 1820. That was before the school was built. The land around this building was all part of the Linden Estate. Was this building part of the estate property, too? In 1820, it would have been owned by Lucy Monoux, who later gave the land for the school next door, so it’s entirely possible that she owned this house then too. The Linden Estate definitely included Linden Farm when it was sold to the Duke of Bedford around 1890. The buildings on the left of all these pictures, which are now part of The End House (that’s its name), were Linden farm buildings then. 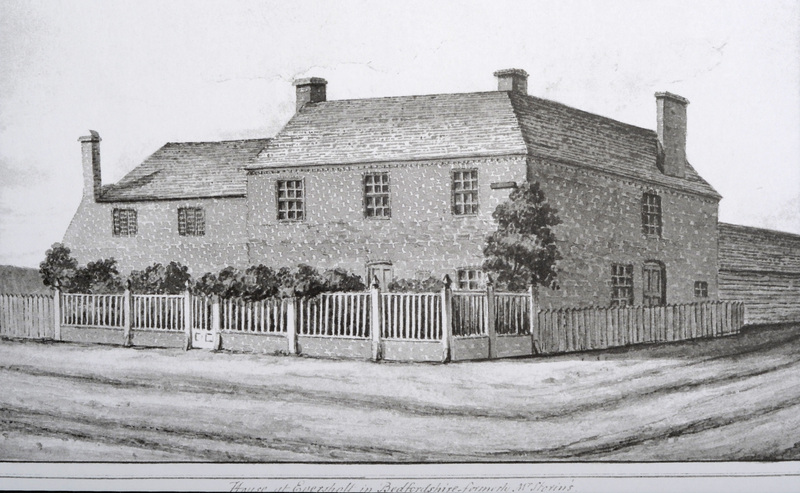 So maybe School House started as the farmhouse for Linden Farm. But that’s pure conjecture. Ah! Aren’t search engines wonderful? The Stovin family did live in Eversholt and were well off, since Miss D Stovin of Eversholt was a subscriber to “An historical and topographical account of the town of Woburn…” by Stephen Dodd, published in 1818 and available free. 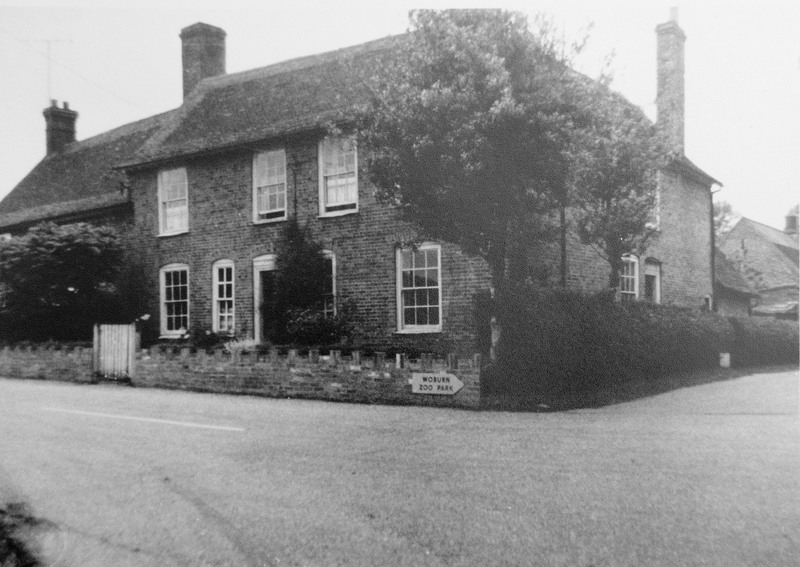 Another subscriber was Mr Sandys, who may have lived over the road at what is now Linden House. And also Lucy Monoux, who lived round the corner at what was then Linden House! So it seems likely that the Stovin family did live in what is now School House. To complete the picture, here is School House in 2012. Emrys Williams took this photo from within a metre of where whoever took the 1965 picture was standing – in the middle of the road – and places it in the public domain.